There's something for everyone here. 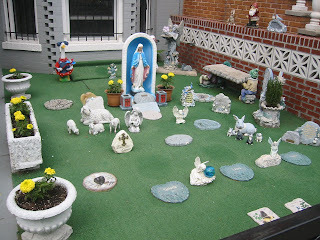 Saints, angels, lambs, fairies, flowering plants, garden gnomes, bunnies, and pinwheel holding geese in patriotic outfits. We paused for quite a while in front of this "garden." There was something quite touching about it. I have to wonder if the choices in the garden represent the tastes of each of the people named on the stones. It's organized, neat, and lovingly arranged.